08 Jun 2016 / 08:47 H.
Seven new cars were damaged when a trailer transporting them overturned at KM421.7 of the North-South Expressway near Bukit Beruntung. KUALA LUMPUR: A trailer carrying seven new cars went out of control and skidded into the opposite lane at KM421.7 of the North-South Expressway (north-bound) leading to traffic congestion for about four hours in both directions, today. Hulu Selangor district police chief Supt R. Supramaniam said in the noon incident, the trailer was heading towards Penang from Malacca. "The 40-year-old trailer driver lost control of the vehicle and hit the road divider and skidded into the south-bound lane. "The trailer also hit two other cars," he told Bernama when contacted here today. 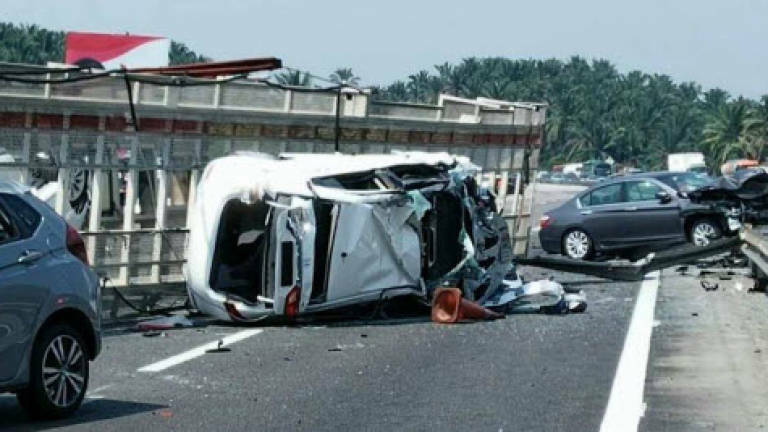 Supramaniam said no one was injured in the mishap, but the impact had caused the vehicles on board to be damaged and traffic congestion stretching for three kilometres. The clearing work ended at 4pm today.